Through five discursive chapters, Ramsey, who is Professor of Music and Africana Studies at the University of Pennsylvania, unpacks these various threads with formidable scholarship and an attitude rooted in critical-theory aesthetics. Ramsey cites dozens of pertinent monographs published over the past quarter-century, synopsizes their theses in reasonably clear prose, and dialogues cogently with the academic peers and intellectual forebears he references. In tracing “Powell’s points of intersection” along this interdisciplinary matrix, he allies himself with Professor George E. Lewis’ concept of “Afrological” and “Eurological” modes of artistic consciousness. Ramsey convincingly situates Powell within parallel streams of Afro-American literary and visual arts activity during the ’30s, ’40s and ’50s; less persuasive are several digressions that incorporate feminist theory, particularly in the chapter titled “Bebop Virtuosity, Manhood, and a New Social Contract.” He models the final chapter, “Exploding Narratives and Structures in the Art of Bud Powell,” which comprises musicological analyses and transcriptions of several phases of Powell’s improvisations and compositions between 1944 and 1953, on pianist-composer Vijay Iyer’s theoretical work. Granted Ramsey’s self-limiting parameters, it is nonetheless disappointing that he presents such scant detail about Powell’s flesh-and-blood particulars. There is a minimum of originally generated first-person testimony from Powell’s intimates, associates and peers (Ramsey cites a snippet of 1994 interviews with Powell’s daughter, Cecilia, and son, Johnny). Instead, Ramsey quotes liberally from oral histories like Robert Reisner’s Bird: The Legend of Charlie Parker and Dizzy Gillespie’s seminal autobiography, To Be or Not to Bop. Perhaps Ramsey’s familiarity with the latter work explains why his lengthy accounts of Gillespie’s career during the ’40s and early ’50s contain more psychological penetration than anything he writes about Powell, who-even in Ramsey’s judicious passages about his struggles with mental health and substance abuse-comes off as an objectified text, a kind of blue screen onto which the author can project his ideas. 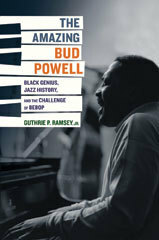 For a vivid portrayal of the real-time milieu in which Powell functioned, Peter Pullman’s exhaustively researched, self-published Wail: The Life of Bud Powell (2012), undertaken completely on his own dime, is unlikely to be surpassed. In constructing this novelistic account, written in crisp, declarative sentences with minimal jargon, Pullman draws on several hundred personally conducted interviews, medical and psychiatric records, correspondence, press accounts in several languages and urban micro-histories. Pulling no punches, addressing Powell with the unflinching honesty that suffused his musical production, Pullman generates a biography worthy of his subject, one that can stand with Robin D.G. Kelley’s 2010 biography of Powell’s own mentor and brother-in-arms, Thelonious Monk.